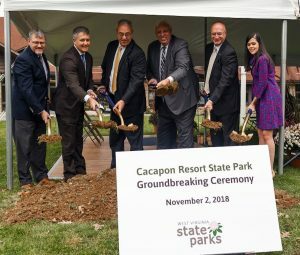 BERKELEY SPRINGS, W.Va. — Ground was broken during a ceremony Friday for major improvements at Cacapon Resort State Park in Morgan County. 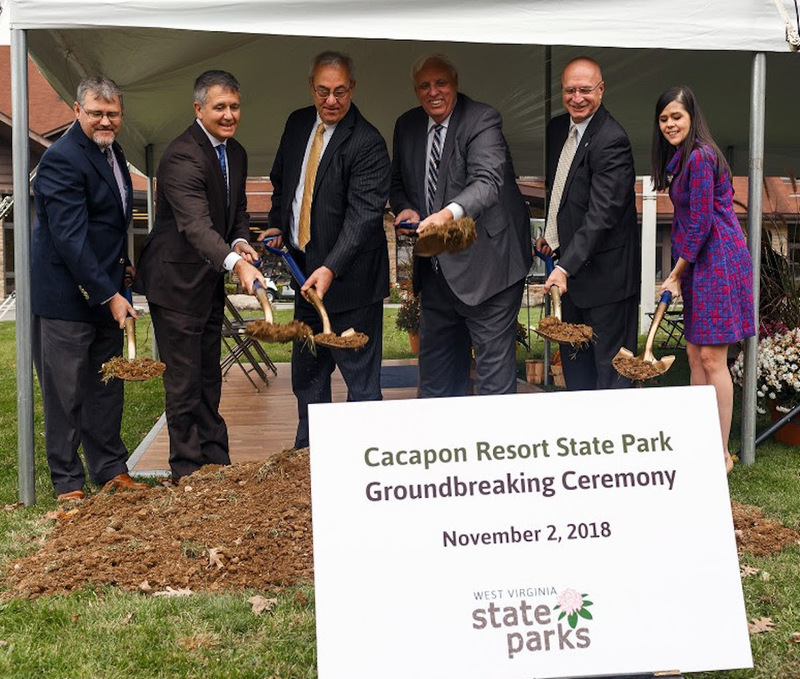 State and local officials worked the shovels and praised the $25.38 million project, which will bring much-needed upgrades to Cacapon Resort and provide additional attractions for visitors to the Eastern Panhandle. Among those participating in the groundbreaking were, from left, Del. Daryl Cowles, R-Morgan; Stephen McDaniel, West Virginia Division of Natural Resources Director; Sen. Charles Trump, R-Morgan; Gov. Jim Justice; Sen. Craig Blair, R-Berkeley; Chelsea Ruby, West Virginia Tourism Commissioner. Major projects to be completed include the addition of 78 guest rooms, a dining room, a lounge, a spa and an indoor pool at Cacapon Lodge. Existing facilities also will receive major upgrades, including remodeling each existing guest room, creating new conference space, renovating the lobby and upgrading utility and electrical equipment. Construction is already underway and is being performed by Paramount Builders of Saint Albans, the low bidder. Work is expected to be completed by 2020. The project is being funded by bonds financed with excess lottery revenue. Cacapon Resort State Park’s lodge was built in the 1950s. The park also has 31 cabins, a 12-room inn, a large conference room, a restaurant and many outdoor opportunities, including golf, lake and hiking opportunities. More information about Cacapon Resort State Park can be found at www.wvstateparks.com.